It seems like everything is going "mini" lately. Mini pies, mini cakes, mini sandwiches, mini, mini, mini! 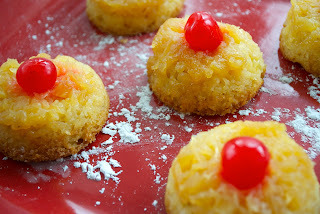 I saw these mini Pineapple Upside Down cakes on Manu's menu and knew I had to try them. They are perfect for a party, and for treats for friends! They are easy to make, and so very good. Brush the muffin pan with the melted butter and sprinkle the brown sugar in the bottom of each cup. 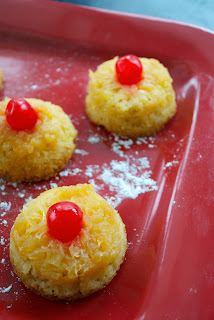 Add a Tb of crushed pineapple (and a candied cherry in the middle). Whisk the egg, yogurt, melted butter and a dash of vanilla in a bowl. Stir in the flour, sugar, baking powder, baking soda and a pinch of salt. Whisk well. Divide the mixture into each of the cups. Bake for 20 minutes in a pre-heated oven at 350°F/180°C. When ready, let cool. Then carefully unmold the tea cakes. Sprinkle with powdered sugar. Blueberries or cherries are great on top! Too cute! I love all things mini.